Enhance your invitations or table decorations with some beautiful ribbons for Centre pieces or on name cards/invitations! We have a great range to suit. 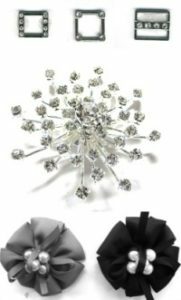 Greenfields is offering a HUGE range of metal and Diamonte accessories to give your dress the special bling. If you are looking for decorative metal buckles with a bit of sparkle check out of diamonte metal buckles ! We also have a very large selection of brooches of all different shapes and sizes both with or without diamontes. Flowers, geometrical – you name it we have it. All of these brooches have a minimum order quantity of 1 so they are perfect for adding that special touch. Check them out here! Looking for something to make your event look that little bit nicer? A bit fabric in the right place can make all the difference! We stock a huge range of fabrics ideally suited to use at your next event. If you are looking for a good fabric for chair covers you could try a few of our knitted fabrics which will &^%&hug&^%& the chair but not be slipper to sit on. Check out our Mechanical Stretch or Knit Jersey. To give the table a bit of shine or make a nice organza bow around your chair we have a number of great organzas for you to try in various widths. Check our Crystal Organza, Poly Organza or Nylon Organza. For something really different and for that WOW effect try out new Patent Plastic – light enough for a table covering but a great effect! Of course we have a wide range of brooches and ornaments to embellish the table! Drapes or canopies can add an extra special effect to any event. We carry a wide range of fabrics suited for this. High Multi Chiffon is light, transparent and give a good flow effect. Alternatively a heavier weight cotton gives you a solid look without being too heavy to drap. Please contact us if you have any questions about these or any other fabrics you would like to use for your next event. Please note: None of our fabrics are fire retardant, however we can direct you where this can be done!